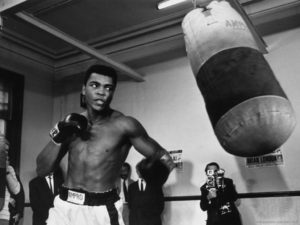 Ali in 1960 was the Golden Gloves National heavyweight champion and the AAU National light heavyweight runner-up. The last person to defeat him in the amateurs is a name few have ever heard of but this writer knew the name Staff Sgt. Percy Price. Price served two tours in Viet-Nam. He entered the Marine’s in 1955 and retired in 1976. Price was from Salem, NJ, but retired and moved to Jacksonville, FL. Price was a 3-time All Marine champion, two Interservice championships and one CISM championship. At the Olympic trials he defeated Hal Epsy to represent the USA in the 1960 Olympics at Rome in the heavyweight division. He won his first match knocking out Ronald Taylor of Australia in two rounds. In the quarter final he lost to Josef Nemic of CZ 4-1. Nemic appeared in three Olympics in 1956, 1960 winning a Bronze Medal and 1964. In 1956 he was knocked out by USA’s Pete Rademacher in two rounds. The latter went on to win the Gold Medal in the Olympics and fought Floyd Patterson in his debut for the heavyweight title having the champion on the floor in the second round before being knocked down six times and for the last time in the sixth round. Ali represented the USA in the light heavyweight division. Ali always had a problem with southpaws. He lost to Amos Johnson in the 1959 Pan Am Trials. He went onto get to the finals after defeating Yvon Becaus, of Belgium, RSC 2, Gennadi Schatkov, of USSR 5-0, Tony Madigan, of Australia, 5-0 and in the final Poland’s southpaw Zbigniew Pietrzykowski, 5-0. If Ali would have represented the USA in the heavyweight division and he would have got to the semi-final he would have met another southpaw from Italy Franco de Piccoli who defeated the man Price lost to Nemec 4-1. Then he defeated Daan Bekker of South Africa for the Gold Medal. As a professional de Piccoli won his first twenty-five fights, twenty by knockout before losing to American Wayne Bethea and then Jamaica’s Joe Bygraves by knockout in back to back losses. He would go onto win his next twelve fights before losing his last two bouts by knockout to American Everett Copeland, 3-7-3 and Peter Weiland, 8-2 in his final fight. In closing out his career he was 37-4 (29) at age 28. Some of the boxers he defeated were Billy Daniels, 19-6-1, who gave Ali fits as a pro. Also, Americans Herb Siler, 20-9, who Ali defeated earlier, Floyd Joyner, 23-9-3, Howard King, 42-26-8, Tony Hughes, 26-2, Buddy Turman, 35-9-1 and German Uli Ritter, 21-9-6, breaking a bone in his left hand. Ali’s amateur record was mentioned with six different totals like 100-5, 118-5, 127-5, 134-7, 137-7 and 99-8. He was a six-time Kentucky Golden Gloves champion.